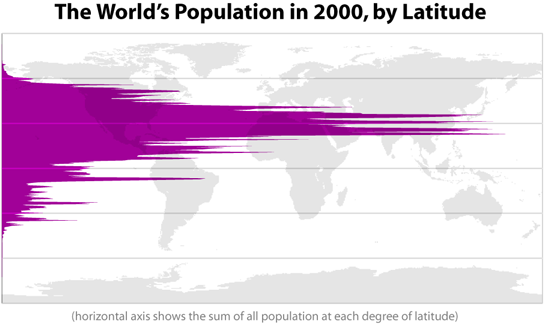 Radical cartographer and Harvard grad student Bill Rankin devised these fascinating maps, which show the sum of all population living at each degree of latitude or longitude circa 2000. As you can see above, there's quite a northerly bias: According to Rankin, roughly 88 percent of the world's population lives in the Northern Hemisphere, with about half north of 27 degrees north. Rankin: "Taking the northern and southern hemispheres together, on average the world’s population lives 24 degrees from the equator." Longitude map below: This time, the East wins handily.